Тема: Подорожі. Орієнтування в місті. виховна: виховувати культуру спілкування та вміння орієнтуватися в місті; підтримувати інтерес до вивчення англійської мови. Обладнання: мультимедійна презентація, шаблони для створення діалогу, навчальне відео та відео для фізкультхвилинки. - Good morning, my dear pupils. It is a nice day today and I’m glad to see you again. At our lesson we’ll continue our speaking about travelling. ІІ. Введення в іншомовну атмосферу. So, tell me, please, how can we travel? Listen a poem and be ready to read it after me. And we go by plane. From here to there. ІІІ. Повідомлення теми та мети уроку. - Today we’ll speak about asking and finding places you need for in the town and how to give the directions. - Look at the picture and tell me, please, what can you see here? - Where is the bank? Hospital? School? 2. Ознайомлення з новим матеріалом. 1. 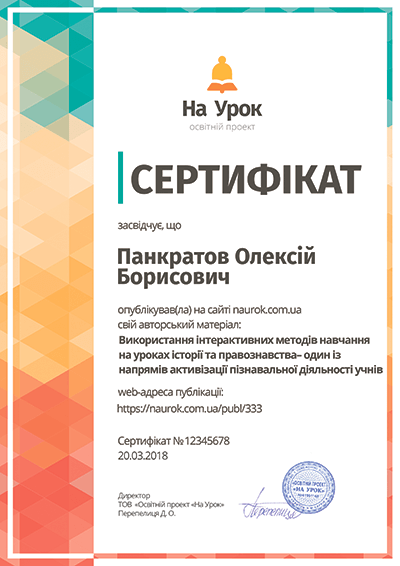 Робота з підручником. Ознайомлення з новими ЛО. - Open, please, your books on page 81. If we want to find some building we must learn the new word combinations. Look at exercise 2 and repeat after me. - Don’t close your books and look at the blackboard, I have got a map of the town. How do you think what building is it. Who can write down this word? Can you spell it? Is it right? I’m here. How can I get to the hotel/ kindergarten/ supermarket…? 2. Аудіювання. Робота з відеороликом. - Now we will watch a video and you must understand which places people looking for. - What about the first girl? What place does she looking for? - What about the man? - Look at your books on page 80, exercise 1. We have a map, we have streets and buildings on it. What buildings have we got in the London Road/ High Street/ Market street/ West Street…? What street the restaurant/ Zoo/ hotel/ school is? - Look at the exercise 4. Listen the dialogue and repeat after me. Учні читають за вчителем, потім читають в ролях. - And now let’s make some short dialogues. I am standing here. How can I get to the cinema? Zoo? 3. Закріплення вивченого. Робота в парах. - My dear children now you must make your own dialogues in pairs. And be ready to act out it. I’ll give you a few minutes to do it. P1: Excuse me. Can you help me? P1: Is there a ________________near here? P2: Yes. It’s in _______________________________. - At home you have to prepare some sentences about your way from home to school in oral form. Thank you for your work today. You work hard, so today I put you many excellent marks. That’s all for today. See you next time. Goodbye. Розробка заняття для літнього мовного табору "Animals.Unusual pets"
Урок-гра на тему "День Святого Валентина"